Note that a Mac version is forthcoming. Anthony, you should add Mike Gravel, and Sam Seder. Mike’s considering a run for president as a democrat, and Sam had the highest polling percentage in a recent poll for the Libertarian Party nomination,by Third Party Watch (I can send you a link to the poll if you want). The updates are coming along really well. The primaries are so much more improved now the news profile provides such a boost. The auto save issue seems to be fixed in the sneak peek. Also in Gillum bio, it says senatorial instead of gubernatorial race. I realise it’s a hypothetical but given that AOC isn’t even eligible to run, it seems slightly strange to include her. It’s no stranger than having three former presidents who served two terms included as what if candidates. Negative bonuses don’t seem to be working. @TheLiberalKitten, thanks for this – noted. @Will re AOC being included, read the blurb for her in the game. It addresses exactly that point. @SirLagsalott, thanks for this also – noted. @WVSocialist re Gravel, he might be added if he gains some traction. Re Seder, we’ll keep a watch on the Liberatarian nomination, but my sense is these things get clearer closer to the nomination date. Yang added in latest internal. @anthony, Just a quick question, while the ”dog-piling’ issue is being looked at, do you have any tips for starting as leading candidates to avoid massively hemorrhaging votes as you can’t go unnoticed while building support. Relations are the key – the better your relations with other candidates, the less likely they are to attack you. This includes NA Pacts. I noticed an issue with a few of the 2020 endorsers creating surrogates with the wrong name (Abrams, DeSantis, and Dole). Cathy McMorris-Rodgers is also an Oregon endorser when she should be a Washington one and Justin Amash is listed as a Fmr. Rep when he is a current Rep.
1) When starting on Nov. 3rd 2019 by Jan. 2020 it becomes impossible to save a game and it crashes with this message: Out of memory. (I have a computer on which much heavier games go perfectly well). 2) The % of undecided voters is extremely high, with peaks of 70% in the early states. It tends to increase throughout the game rather than decreasing. Ok, I am now able to play a full game from primary to election day, I just have one question. Is it normal for the game to slow down considerably towards the end of the game? I’m having the same issue as @Gregory Stevens with undecided voters in the primary being extremely high as the campaign progresses, in many cases steadily increasing to 70% in early states like Iowa and this is in October 2019 from the June 2019 start! I also tested it in general election scenarios for not just 2020 but almost every other of the official ones as well and the same problem happened (except for 1968 for some reason). Instead of the number of undecided voters decreasing as Election Day approached they either held steady or increased, being especially bad in the cases of 2020 and 2016 with up to 33% of voters undecided by the end. They also seem to go disproportionately to third party candidates with up to 20% of the vote in 2020 and 2016 going third party, even when I was observing as the Green Party candidate in 2016 and got 7% of the vote even though I didn’t campaign at all. Definitely an issue worth looking into. To fix the third party problem there needs to be some sort of regional value for how concerned voters are about spoilers, in which case they’ll prioritize their preferred likely winning candidate. I feel like this is a problem with the high number of undecided voters rather than support for third parties being too high (the polling seems to start off right for them) although I only recently started playing PI again after having taken a long break so I don’t know if this was an issue in previous versions after Favorability was introduced. There also seems to be a tendency for huge landslides to happen as well in certain scenarios, probably also because of the increasing number of undecided voters breaking en masse to the leading candidate on Election Day. I had an observer run of 1980 where Carter got only 28% of the vote and Anderson (who I was observing as) somehow got 15% despite me having done nothing. I ran some simulations of it as well and the average is 33% for Carter, 53% for Reagan, and 14% for Anderson across 20 simulations which I think illustrates the problem with undecideds. It seems trying to fix the undecideds problem with the 2020 Democratic primaries might have had some unintended consequences for the general election. @Somberg, thanks for these – noted. @Gregory, this bug seems system dependent, and I have been unable to recreate it thus far. It’s noted. @Chad, if you have autosave on, it will slow down as the save file becomes bigger and bigger (more historical data). Otherwise, no – it should become quicker as candidates withdraw. I have a question about the voter detail introduced in a former update in the more options screen when starting the game. What exactly does it do? Voter Detail increases the number of virtual voters in the sim. This is important in particular if you have 3rd party primaries, where you need more voter resolution for realistic dynamics for that party. So, if 3rd party primaries are important to you, consider setting Voter Detail to a higher value for more realistic dynamics. 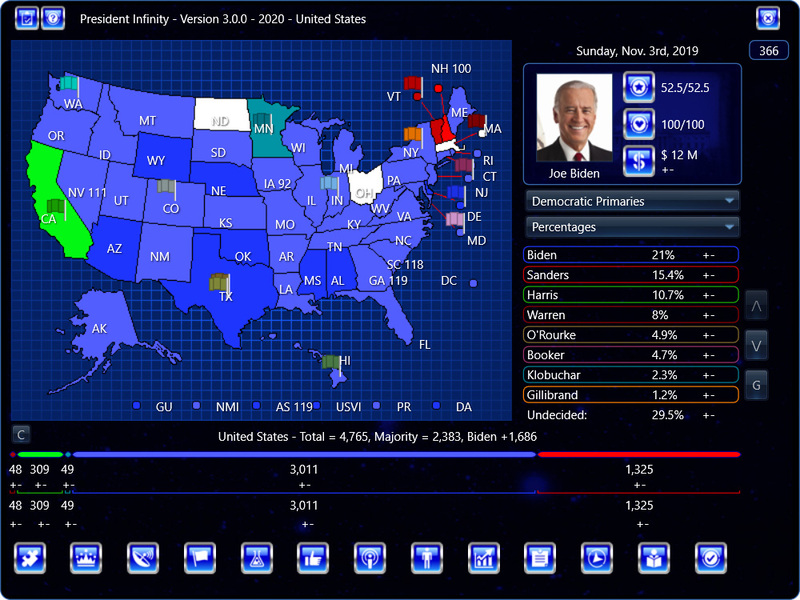 I’m having an issue where the number of undecided voters increases as the game progresses rather than decreasing. By the time Iowa came, undecided voters were at 93%! This led to Castro, who was polling at 1%, winning Iowa by a margin of 30%+ and going on to win the primary in a landslide. I’ve never had this particular issue before, so not sure what’s going on with the new update. Nothing else is really working for me either – no matter how much momentum I have or how many ads I run, my poll numbers just continuously drop. Thanks for this – the undecideds increasing problem has been solved in the latest internal (will be released soon). I’m noticing a problem with the scroll bars to select states. The up and down buttons aren’t working, nor is the middle button mouse scroll. The only way to change states in areas like selecting a state for an ad is with the up/down keyboard keys. Ok, can you tell me exactly where you are experiencing this problem in the game, and whether you are using Windows or Mac?